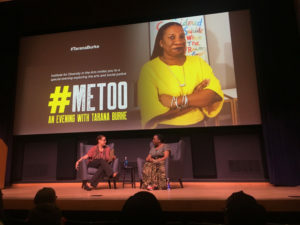 In a conversation in Cubberley Auditorium Tuesday evening, civil rights activist Tarana Burke discussed her activism regarding sexual assault, her experience with abuse and her path to healing as a survivor. One of Time Magazine’s 100 most influential people, she coined the phrase “Me Too” in 2006 to raise awareness of the pervasiveness of sexual assault. Burke discussed Me Too’s development into a broader movement following the 2016 use of #MeToo as a hashtag. She shared that her work to interrupt sexual violence was not only a quest for social justice, but also a personal path to healing. Burke spoke in conversation with Alisa Bierria Ph.D ’16, a postdoctoral fellow at the University of California, Berkeley’s department of Gender & Women’s Studies. The event was part of the Institute for Diversity in the Arts’ (IDA) spring course, “Art + Community: Division, Resilience and Reconciliation” and was co-sponsored by Feminist, Gender and Sexuality Studies, The Markaz, African & African American Studies, the Asian American Activities Center, Stanford Arts, the Women’s Community Center and the Black Community Services Center. A-lan Holt ’11, associate director of IDA, opened the conversation by reflecting on the event’s aim to “sustain community, especially in times of tension and polarization.” She then introduced Burke, who entered the room to a standing ovation. Bierria praised Burke’s intentionality in her mission to prevent sexual assault and create a network of support for survivors, especially for low-income women of color. Burke’s fight for social justice began years before the beginning of the Me Too movement. She shared that her personal experiences with sexual abuse inspired her to become an activist. In 1996, Burke worked at a youth camp predominantly attended by children of color. There, Burke recalled that a young girl confessed her own experience with sexual abuse to Burke, who struggled to come up with a response. That moment was the spark that motivated Burke to embark on a mission to raise awareness and prevent sexual abuse in society. Burke vowed to always have a response for any girl who had the courage to share her story. Burke found support and solace in her activism. “I always explain the work of the Me Too movement as individual healing and community healing,” Burke said. While Burke believes that survivors of sexual abuse are the ones who are most capable of finding solutions to ending sexual violence, she emphasizes the importance of also prioritizing personal healing. Burke criticized the classist view of the way society today treats healing and therapy, saying that people falsely assume that healing can only take place in professional spaces, such as a therapist’s office. While Burke created the Me Too movement to shed light on the plight of black women and girls, she emphasized that a social justice movement that centers around a marginalized group is not to the exclusion of anybody else. Burke is currently laying the groundwork for the future of the movement. Because the movement went viral online, Burke said she hopes to create a space for it to survive online beyond its status as a hashtag. She shared her plans to scale up the work of the movement, increasing accessibility by developing an online community. “The work of Me Too is not about Me Too. It is about what happens after you say Me Too,” Burke said. Above all, Burke credits her ability to document her joy as the key component in her recovery. If you have experienced sexual abuse, visit notalone.stanford.edu for more resources. Alex Tsai ’21 is a desk editor for The Daily’s academics beat. She was born and raised in Hong Kong for 13 years and moved to La Jolla, CA for high school. Alex walked onto the varsity lacrosse team this year and is interested in computer science.